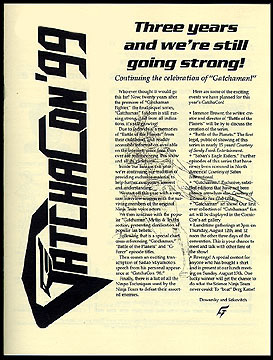 Information: A privately published, limited-edition handout for attendees of GatchaCon '99. This show was held as part of the San Diego Comic Convention. The fanzine included a translation of an interview with the original "Gatchaman" Ninja Team voice actors, a continuation of last year's "Myths and Truths" section, a story chart showing all the episode titles from the first "Gatchaman" series, cross-referecend with their corresponding "Battle of the Planets" and "G-Force" titles, a transcript of an interview with last years's special guest, Sadao Miyamoto and finally a section detailing all the "Ninpo" techniques used by the Ninja Team in all three series.